Our free clinic in Charleston, SC, is able to operate and serve hundreds of uninsured patients who live or work on Johns, James & Wadmalaw Island or Folly Beach – thanks to the good will and contribution of our donors. Each month, The Free Clinic will pay tribute to one of our many generous supporters who seek to improve the overall health and goodwill of the community. This month, we shine a spotlight on Kiawah Seabrook Exchange Club! The Kiawah-Seabrook Exchange Club is a member of the National Exchange Club, which has over 20,000 members in 650 clubs across the US. The Club’s Programs of Service focus on prevention of child abuse; youth development and education; Americanism; and community service. As a service club, the Kiawah-Seabrook Exchange Club holds an individual mission is to help schools, programs and agencies that benefit the immediate community – and Barrier Islands Free Medical Clinic has received funding from the Kiawah-Seabrook Exchange Club the past ten years to help pay for patient medical services. In addition to their generous support, several of the members of the Kiawah-Seabrook Exchange Club volunteer their time and talents at the Clinic throughout the year. 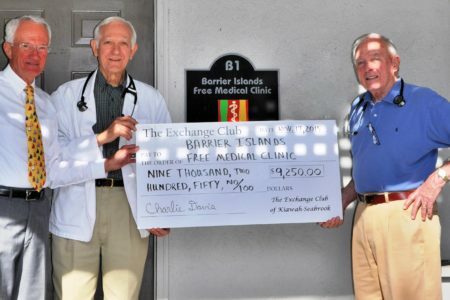 Dr. Charlie Davis, co-founder of BIFMC and former President of the Kiawah-Seabrook Exchange Club, shares more about the charitable organization and why it chooses to give back to the Clinic. BIFMC: How does the Exchange Group determine what orgs to allocate funding to? Dr. Davis: The Kiawah-Seabrook Exchange Club sells ads to the local service providers that are displayed in the Kiawah-Seabrook Exchange Club Directory / Handbook. The funds that are generated from the ad sales are available for our annual grant funding program. The four programs of service committees review the grants submitted in their area. The committees score each grant for its merit and recommend an amount of money to be funded. The Kiawah-Seabrook Exchange Club Board of Directors vote on the committees recommendations and that amount of money is awarded. The Club has a foundation that can vote to supplement funding for the grants also. Dr. Davis: BIFMC provides free medical care to eligible adults, which qualifies in the Exchange Club’s category of community service. BIFMC: Why do you feel it is important to “give back” to your local community? Dr. Charlie Davis: It is the right thing to do! I believe that the good Lord put us on this earth to love and help others. As a retired physician, I wanted to make free medical care available to the uninsured, low income adults that live or work on these barrier islands. BIFMC’s spiritual mission statement is taken from Matthew 25:40. Jesus said, “whatever you did for the least of these brothers of mine, you did for me”. Thank you to The Kiawah-Seabrook Exchange Club for their continued commitment to supporting the needs of our uninsured community members and neighbors! If you are interested in making a charitable contribution to Barrier Islands Free Medical Clinic, please click here. To learn more about how your generous donation helps our patients, click here. You can find all of our previous Donor Spotlight features here.